Safety first: Safety should be your first concern when fishing before or after storms. 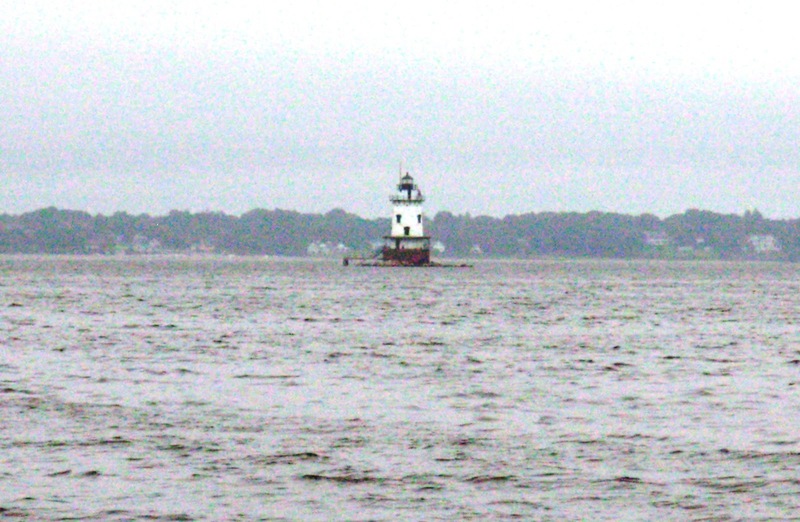 Anglers often like fishing in favorite spots (like this one at Conimicut Point) before a storm as the barometric pressure drops fishing generally improves. Fishing after storms can be good too. 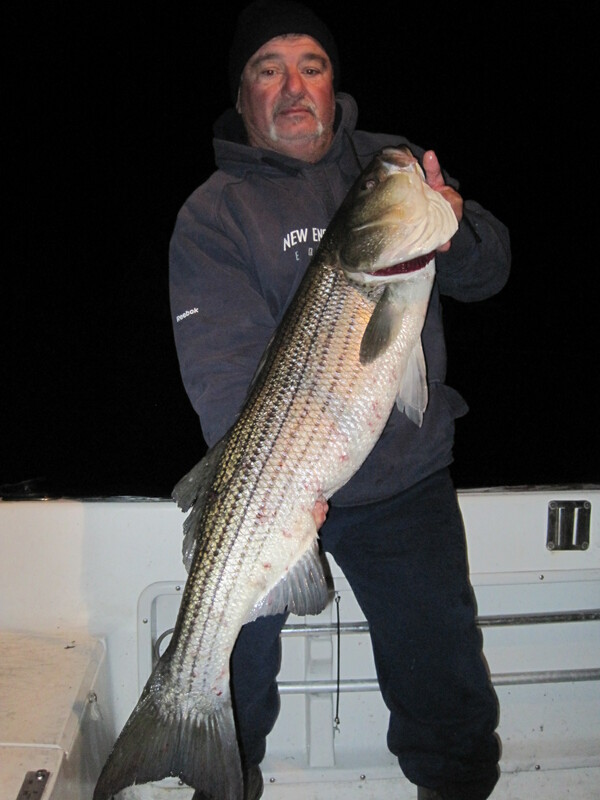 Fishing after storms can be good: fish like this long 41”, 20.5 pound striped bass caught a couple of weeks ago by Albert Bettencourt of East Providence can be caught after storms too. Al was drifting eels off Barrington Beach at 3:45 a.m. when this fish hit. Many anglers believe the best time to fresh or saltwater fish is before a storm… before a cold front moves in. They believe the fish feel the difference in barometric pressure… the front moves in, the pressure drops and it triggers a feeding frenzy. I guess the fish sense bad weather so they eat while the eating is good. Many also believe that during and after a storm fishing is not good as the water is turbid and cloudy so fish cannot even see the most attractive bait. However, this is not necessarily true. Sometimes fishing after a storm is good. Just like any other time, the right time to fish depends on a lot of variables… water temperature, oxygen level in the water, water movement, structure and most importantly bait in the area that fish can feed on. Safety is the most important thing to remember when fishing before and after storms. I head for shore if the weather is threatening, if on shore do not take any risks fishing near high surf that is unpredictable. Wait until things calm down. Other contributing factors to good fishing after storms are geography and storm patterns. For example, with storm winds coming out of the southeast, south and southwest… bait, crabs, oysters, mussels, clams, etc. get crushed and pushed to the opposite shoreline or get hung up on ridges. These areas become prime feeding grounds for hungry fish. Good idea to try clams and split crabs as bait when fishing after a storm in these areas. First tautog: Michael Weaver of Plymouth, New Hampshire, with his first tautog caught while fishing with Captain Dave Monti in North Kingstown. The tautog was 21 inches and weighed about 7.5 pounds. Tautog fishing remained strong prior to the storm. Last week while fishing the General Rock, North Kingstown area I met Captain John Sheriff of Captain Sheriff’s Fishing Charters returning from Whale Rock, Narragansett, RI where he landed five nice keepers there. I was fishing General Rock with my brother-in- law Michael Weaver of New Hampshire on Friday afternoon who fished for tautog for the first time. He landed four nice keepers, the largest was about 21”. Michael was amazed (as we all are) at the fight tautog have in them once hooked. Pound of pound they are one of the strongest fighting fish as they run for cover back into structure (very similar to grouper which are commonly caught off Florida shores). It was such a pleasure to experience his (our) excitement as Michael reeled in a big tautog with his rod bent in half. As the fish hit the deck I yelled, “Wow! That’s what I’m talking about.” The fish measured 21 inches and was about seven and a half pounds. Most fish that day were caught an hour after low tide with a good bite lasting until 3 hours after the low tide. We used green crabs cut in half and occasionally chummed with crab legs and crushed crabs. 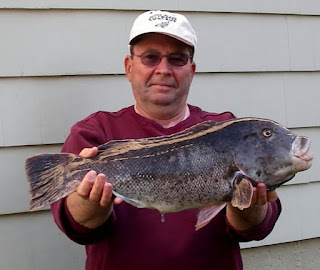 Tautog tips have appeared in this column throughout the spring and fall and many of them deserve repeating as to catch this species my experience is that conditions, gear, fishing and boat locations have to be just right. Often times one angler may be catching fish and another one three feet away may not be catching fish. So here are some tips. 1. Find structure to find tautog. Tautog can be fished from shore or boat and in both cases they like structure (rocks, wrecks, bridge piers, dock pilings, holes along the coast, etc.). 3. Boat placement is important. Use electronics to find structure, estimate wind/drift direction and anchor up current from where you want to fish and drift back to the spot as the anchor is setting. Once in position, fish all sides of the boat casting a bit to cover as much area as you can. If still no bites, let some anchor line out a couple of times to change your position, if still no bites it is time to move the vessel. 4. Green crabs and Asian crafts are the bait of choice in the fall, however, in the spring clam worms and clams work well as the tautog seem to like soft baits. When using crabs make it easy for the tautog to bite and take the bait. Break off claws and legs, cut the crab in half and hook it through one leg socket and out another. 5. Feel the bite… tap, tap and then get ready for a tug of war. 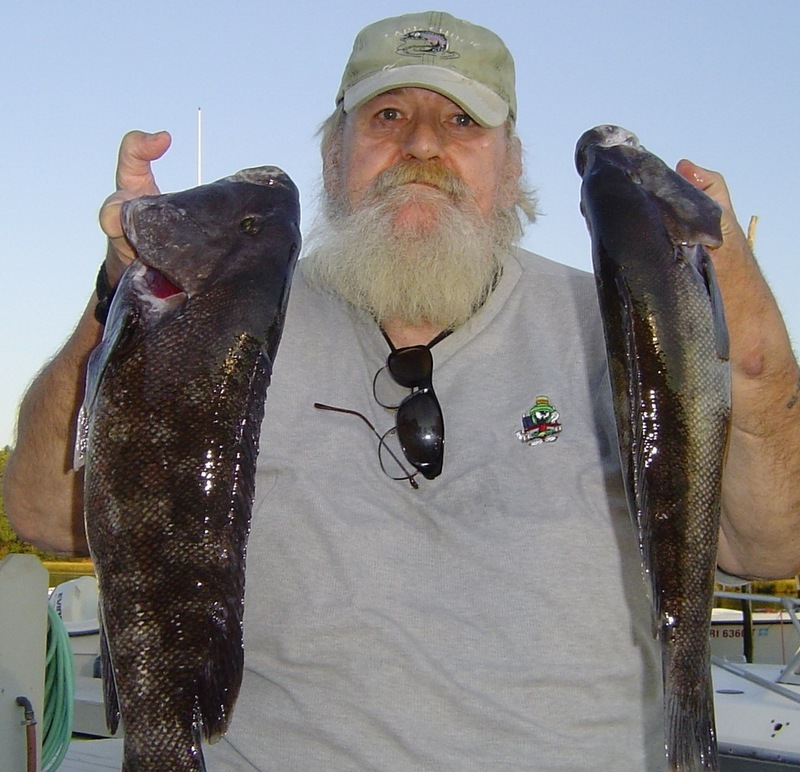 Captain George Cioe said, “I believe with the first tap the tautog is positioning the bait for consumption.” On the second or third tap I raise the rod up firmly feeling the weight of the fish (no need to jerk the rod up hard). Once the fish is hooked, keep the rod up and pressure on so the fish in not able to run for cover. 6. Use braid line with little drag. Braid line allows you to feel the fish tap. Monofilament line will stretch allowing the fish to run for cover. 7. Where to fish for Tautog. From shore, look for rocky coastline like Beavertail Point on Jamestown, locations off Newport, Point Judith and off jetties at South County beaches. 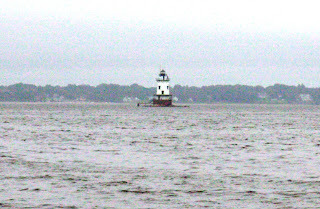 From a boat, I have had good luck at Conimicut and Plum Point light houses, rock piles off Narragansett Beach and at Whale Rock, the jetty at Coddington Cove in Middletown, off Hope Island at rock piles and mussel beds on both the north and south sides, in the General Rock area in North Kingstown, around Brenton Reef in Newport and Ohio Ledge in the East Passage. The Atlantic States Marine Fisheries Commission (ASMFC) Public Hearing in Rhode Island on Draft Amendment 2 to the Interstate Fishery Management Plan for Atlantic Menhaden will take place Thursday, November 1, 6:00 p.m. at the University of Rhode Island Bay Campus, Corless Auditorium, South Ferry Road, Narragansett, Rhode Island. The Draft Amendment presents a suite of options to manage and monitor the stock in both the short and long-term. Atlantic menhaden are an important species. As filter feeders they are good for the environment, are a primary food source for many species (including striped bass) and they are harvested commercially for the production of many products for both human and pet consumption. The National Oceanic and Atmospheric Administration’s (NOAA) fisheries division announced that the 2012 black sea bass recreational harvest limit has been reached. Effective 0001 hours, November 1, 2012, no one may fish for or possess black sea bass in Federal waters for the remainder of the 2012 calendar year, unless issued a commercial moratorium permit and fishing commercially. Recreational anglers may continue to fish in State of RI waters within the three mile limit until December 31, however, federal party and charter boat permit holders may not unless they give up their black sea bass party/charter permit. Party and charter vessels can request to get their permit back later (it is about a 30 day process to get it back). NOAA fisheries said it is different for vessels with a commercial limited access permit, they would lose the limited access permit for good if they gave it up. In regard to the black sea bass commercial fishery in RI, effective November 2, 2012, DEM decreased the possession limit of black sea bass to 50 pounds per vessel per calendar day. The Mid-Atlantic Fishery Management Council voted to increase the commercial quota for spiny dogfish by 14% to 40.8 million pounds in 2013. This increase is good for commercial fisherman and those planning to process the species. It is also good for recreational anglers in that it will help reduce the number of spiny dog fish (commonly called dog fish or sand sharks) that are caught as a by-catch when fishing recreationally. 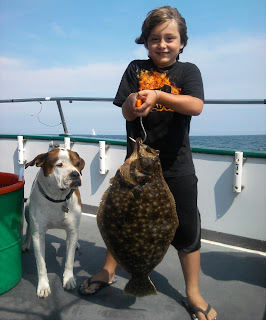 Bottom fishing fun for all: Bottom fish like this fluke (summer flounder), caught on a party boat out of Point Judith, RI this summer, are great fun to catch for anglers of all ages. Tautog rig reduces bottom fishing tie-ups: This tautog was caught using a homemade rig designed by Capt. Monti. An egg sinker on a 3 to 4 inch piece of monofilament with swivels on either end and a single hook below. The bait hangs freely between bottom structure (rocks), reduced hardware and the egg sinker allowed to slide has cut bottom tie-ups in half. Kevin (left) and his father Albert Bettencourt (both of East Providence) have been catching striped bass this fall in the Barrington Beach area and in the Warren River drifting eels. Bottom fishing for fluke (summer flounder), black sea bass, scup and tautog at this time of year can be fun for the entire family. This type of fishing is not stressful in anyway. Learning how to set the hook can be learned in minutes and it does not take a lot of skill to catch a fish. Bottom fishing is great for beginners, particularly children. And the best part is that the down time between bites serves as a great opportunity for family members and friends to socialize and actually converse. Conversation is becoming something of a novelty in within our regular day. I once took my friend Tom and his son fishing. Days later, Tom said, “The best part of the day was that I actually got a chance to talk with my son about his future plans.” So quite often fishing isn’t all about the fish. It is the time we spend together with family and friends that really counts. That is why I love to take families fishing… daughters, sons, son and daughters-in-law, grandfathers, fathers and mothers all get to spend quality time with each other. The bonding and communication that takes place is remarkable. You can learn how to bottom fish by consulting bait shop owners or you can go out on a charter or party boat. Most all of the charter boats that belong to the Rhode Island Party & Charter Boat Association (www.rifishing.com ) are more than willing to take families fishing and teach them how to fish the bottom. Next week you can take advantage of a bottom fishing seminar being offered by the Rhode Island Saltwater Anglers Association (RISAA). The seminar will include panel- like presentations from three top local anglers… Larry Norin, Rick Sustello and Tom Wood. The seminar will be held Monday, October 29, 7:00 p.m. at the West Valley Inn, 4 Blossom Street, West Warwick, RI. Non-members are requested to make a $10 donation to the RISAA Marine Fisheries College Scholarship Fund. The West Valley Inn offers two different dinner entre options from 5:30 to 6:30 p.m. for $6.95. The Bureau of Ocean Energy Management (BOEM) will hold a workshop on windmills and their impact on fishing and will seek input for recreational and commercial fishermen on Friday November 16, from 4:00 p.m. to 7:45 p.m. at the URI Bay Campus, 215 South Ferry Road, Narragansett, RI in the Coastal Hazard Room in the Coastal Institute Building. This input meeting and others being held on the east coast will address future potential conflicts between fishing and wind projects within the Ocean Continental Shelf (OCS). BOEM is seeking input from commercial and recreational fishing industries, as well as fisheries management agencies and scientists, relative to proposed offshore wind energy development. Invitations have been been sent to stakeholders, for information contact Elizabeth Castle at ecastle@ene.com . The Department of Environmental Management's (DEM) Division of Fish and Wildlife has stocked approximately 6,000 rainbow trout in several locations throughout the state this month for the fall freshwater fishing season. DEM Fish & Wildlife staff finished stocking the hatchery-raised rainbow trout this week in Silver Spring Pond in North Kingstown, Beaver River in Richmond, Wyoming Pond in Richmond and Hopkinton, Wood River in Exeter, Hopkinton and Richmond, Upper Pawtuxet River in Coventry, Blackstone River in Cumberland and Lincoln, Round Top Ponds in Burrillville, and Stafford Pond in Tiverton. Earlier this month, trout were stocked in Meadowbrook Pond in Richmond, Carbuncle Pond in Coventry, Spring Grove Pond in Gloucester, and Olney Pond in Lincoln Woods. A 2012 freshwater fishing license and trout conservation stamp is required for anglers 15 years of age and older. Visit your town/city hall, authorized agents such as bait/tackle shops and Benny's to get a license and stamp. You can also visit DEM in Providence or purchase on line via www.ri.gov by clicking on “Hunting, Fishing, Boating Licenses” on the left side of the homepage on the DEM website at www.dem.ri.gov . As of October 20 (and until December 31) the tautog bag limit has been enhanced for recreational anglers from 3 fish/day to 6 fish/day. Minimum size is still 16 inches. In addition, there is a 10 fish boat maximum per day. The 10 fish per boat maximum does not apply to charter or party boats. Tautog. Craig Castro of Erickson’s Bait & Tackle said, “Customers have been doing good at Washington’s Ledge off shore in the Newport-Jamestown areas weather permitting.” John Littlefield of Archie’s Bait in East Providence said that customers are catching tautog at Conimicut Light with a lot of shorts (15 to 1 ratio).” Tautog to 23” have been landed at India Point Park said Dave Henault of Ocean State Tackle, Providence. Last week I caught a 23” fish at General Rock and two other keepers with a ratio of 8 shorts for every one keeper with about 10 small black sea bass. Tautog are also being caught at Point Judith Light in 25 to 45 feet of water said Matt Conti of Snug Harbor Marina, South Kingstown. Fresh water fishing this fall has been slow. With improved weather and recent pond and river stocking with rainbow trout by DEM things are expected to pick up. Offshore fishing has been slow due to bad weather last week. Angler Brian Beltrami with the 8.95 lbs. 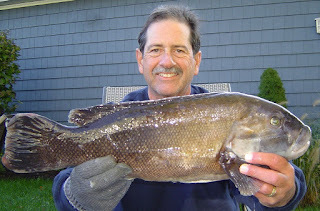 tautog he caught Saturday in Narragansett Bay using green crabs. At the time of the weigh-in at Quaker Lane Outfitters, North Kingstown, the fish was in 1st place in the RISAA tautog fishing tournament. The Rhode Island Marine Fisheries Council (RIMFC) held commercial fluke (summer flounder), scup/black sea bass and herring advisory panel meetings on October 2 in preparation for a Thursday, November 8, 2012 public hearing. The purpose of the advisory panels is to provide industry (fishermen) and the general public with the opportunity to offer input and proposals to be considered at public hearing. Advisory panels reviewed Department of Environmental Management (DEM) presentations on stock assessment, historical fishing activity and allocations. The November 8th public hearing on proposed management plan changes is scheduled for 6:00 p.m. at the University of Rhode Island, Graduate School of Oceanography, Corless Auditorium, South Ferry Road, Narragansett, RI. Commercial and recreational fishermen are urged to attend and provide input on proposals. Summer flounder stock is not overfished and overfishing is not occurring, the fishery is considered rebuilt. RI quota for 2013 will likely be 1.796 million pounds, a decrease of approximately 11% from 2012 quota. A status quo proposal (same quotas/regulations as last year). The Marine Fisheries Division made a proposal to shorten the summer season to May 1 through September 15, but keeping the quota percentage the same for this period at 35%. The proposed change would allow inshore commercial fishermen the opportunity to take advantage of the stock when it was close to shore. A change in starting possession limits were also proposed (see recommendations at www.dem.ri.gov ). Additionally, the fluke advisory panel approved moving a RI fluke sector fishing plan forward to public hearing. The proposal would allow the program to run for one year under the 2011 proposal plan and agreement guidelines giving DEM time to consider departmental policy on alternate fisheries management approaches. Meeting participants applauded the sector’s track record for reducing discards at historically low levels and the program’s financial benefit to even non program members. Non sector fishermen received the benefit of higher market prices in part due to a consistent supply of fish to the market, spreading available fish over a longer time period when they are not ordinarily available. Biological reference points indicate that the scup stock is not overfished and overfishing is not occurring. Recruitment actually exceeded the 1984-2011 average of 104 million in 2011. So the stock is in good shape moving forward. DEM proposed enhancing limits from 5,000 lbs/wk on May 1, 2012 to 50,000 lbs/wk on September 15, 2012. The RI 2013 commercial quota is generally 56.19% of the coastwide summer allocation, so for 2013 this would be 4,995,284 lbs, a 16% decrease from our 2012 quota, however, scup landed in 2012 was well below quota. Scup proposals included a status quo proposal as well as a Marine Fisheries Division proposal to increase the starting aggregate limits in an effort to keep up with the high level of quota. These limits would increase to 10,000 lbs/wk. The stock is not overfished and overfishing is not occurring. 2011 recruitment was 21 million fish, this year and recent years have been near average recruitment. Three closings occurred in 2012 to ensure that RI did not overfish its quota. RI’s share of the Coastwide commercial quota in 2013 will likely be 189,827 lbs which is a 1% increase in quota from 2012. Fishermen (both commercial and recreational representatives) at the advisory panel meeting testified to the abundance of black sea bass (inshore and offshore) at a variety of sizes. DEM recommended no changes to the black sea bass commercial fishery in 2013, however, (due in part from fishermen input on an abundance of stock) fish managers related the stock can likely accommodate more harvest and they will continue to improve estimates in the stock assessment and continue to improve the stock assessment itself so that harvest levels can be increased in the future. The second BSB proposal was from the RI Commercial Rod & Reel Association (RICRRA) pertaining to spring and summer sub-period adjustments to insure the season remain open to offer a consistent supply of product to dealers. The proposal called for a deceased starting possession limits to 25 pounds per day, May through October. A third proposal called for a decreased starting possession limit, increased minimum size, and changed sub periods. The fourth proposal increased starting possession limits to 100 pounds per day, May through October. A fifth proposal set aggregate limits in spring and summer periods. DEM Atlantic herring fishery regulation proposals include a river herring by catch allowance of 5% (which would allow in state and out-of state boats to land their catch in RI, 0% by-catch allowance was the case in 2012. Zero tolerance discouraged commercial fishermen from landing their catch in RI). The second major recommendation by DEM provides for a closure of state waters to herring boats if it is deemed that an area will likely have 5% or more of river herring. These proposed amendments come with a lot of qualifying details, the plan (Part VII – Section 7.19; pages 65-66) can be found online at www.dem.ri.gov. After the November 8th public hearing the proposed regulatory changes to species management plans along with input from the public will be presented to the RIMFC for consideration. The council then votes on the proposed recommendations/changes and forwards its recommendations to DEM director Janet Coit for consideration. Tautog fishing is good but anglers have to work their way through a lot of shorts and an awful lot of small black sea bass to earn keeper tautog. John Wunner of John’s Bait & Tackle, North Kingstown said anglers are catching ten short tautog to everyone keeper. Angler Brian Beltrami said he weighted in an 8.95 lbs. tautog at Quaker Lane Outfitters Saturday that he caught in Narragansett Bay using green crabs (when weighed in the fish was in 1st place in the RISAA tautog fishing tournament). John Littlefield of Archie’s Bait said, “Anglers are catching tautog all over the Bay but there are a lot of shorts mixed in.” Ken Landry of Ray’s Bait & Tackle said the tautog are at Hope Island, General Rock and this week some anglers are catching them off the Rocky Point dock in Warwick. Bluefish are roaming the Bay and coastal shores. John Littlefield of Archie’s Bait said, “One customer had ten fish in the six to twelve pound range lined up on shore at Sabine Point”. Ken Landry of Ray’s Bait and Steve McKenna shore angler said the blues are mixed in with the bass along southern coastal shores. 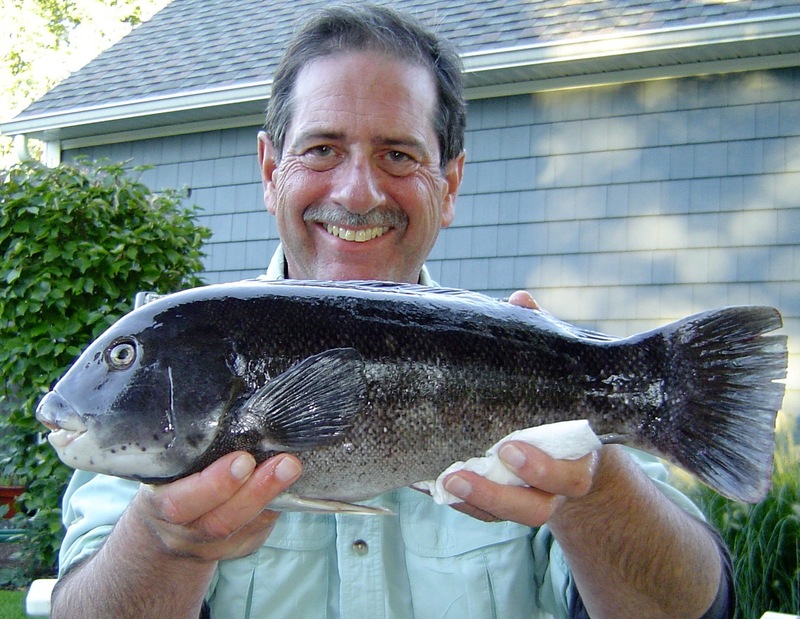 His first tautog: Caption Chuck Daignault has landed a lot of fish in his lifetime as a salmon fishing guide in upstate New York, however until this past weekend, he had never caught a tautog. 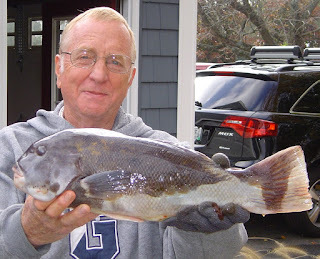 Here Chuck is shown with his first tautog, caught this weekend while charter fishing near General Rock, North Kingstown, RI. Centracchio takes Striper Cup: John Kushnerick of Quantum Reels (left) stands on stage at StriperFest next to Barry Centracchio of Narragansett, Rhode Island, who took Striper of the Year with a 58.80-pound striped bass (shown with replica). Keith Salisbury of Westbrook, Connecticut won Angler Of The Year in the boat division with a 3-fish cumulative weight of 164.70 pounds; and shore division Angler of The Year, with a 3-fish total weight of 138.42 pounds was John Hanecak (right) from Rocky Hill, Connecticut. On The Water magazine celebrated the end of its five-month-long Striper Cup fishing tournament at Striper Fest, held Saturday, September 29 at Marine Park on Falmouth Harbor, MA. Over 4,000 people attended the event and thousands of fishermen from New Jersey to Maine participated in the competition. It was a Rhode Island fisherman who claimed "Striper of the Year" honors. Barry Centracchio of Narragansett, Rhode Island weighed in the largest striped bass in the tournament and was awarded a replica of his 58.80-pound fish on stage at StriperFest. Team winners were determined by the total weight of the 10 heaviest bass a team catches over the duration of the season, with a multiplier of 1.18 applied to shore-caught fish. 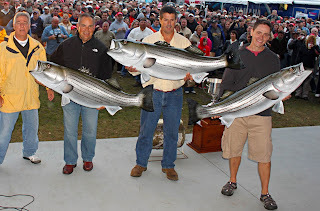 Rhode Island's Aquidneck Island Striper Team placed second, with a total score of 525.30 in the Team event. It was 18 months ago that the Rhode Island Saltwater Anglers Association (RISAA) received a complaint from anglers. Some landowners along the two mile stretch of shoreline between the Quonny Breachway and the Westerly Town beach, along Atlantic Avenue, were blocking lateral access along the shore. Landowners erected fences and would call the police when citizens dared to stop in front of "their private beach." RISAA hired an attorney and then a land surveyor, who worked with a special assistant to the Attorney General and found multiple landowners in probable violation. Last month, Attorney General Peter F. Kilmartin brought an action in Superior Court seeking to enforce the public’s right to enjoy the nearly two-mile section of the Misquamicut beachfront. In particular, the action seeks to enjoin specific beachfront lot owners from interfering with the public’s right to use this dry sand area, alleging that this strand was dedicated to the public by a recorded 1909 plat. Steve Medeiros, president of RISAA said, "We're grateful that he (Attorney General Kilmartin) has been willing to assist us, and now take over this case. It should send a signal that the shoreline of Rhode Island belongs to everyone." The start of the Rhody Fly Rodders' fall and winter meetings and the date of their annual cookout is Tuesday, October 16th at 6:00 p.m. The public is invited to attend. Hot dogs and burgers at 6:00 p.m. followed by a short DVD on Steelhead Fishing by Jim Teeny, then the rest of the evening will feature fly tying and conversation. The meeting will take place at the Riverside Sportsmen’s Club, East Providence, RI. For information and directions, contact board member Peter Nilsen at pdfish@fullchannel.net . The Atlantic States Marine Fisheries Commission’s (ASMFC) Atlantic Menhaden Management Board has released Draft Amendment 2 to the Interstate Fishery Management Plan for Atlantic Menhaden for public review and comment. The Draft Amendment presents a suite of options to manage and monitor the stock in both the short and long-term. Fishermen and interested parties are asked to participate in local hearings and voice their opinions about options presented. If you fish RI coastal waters, offshore or in Narragansett Bay, now is the time to voice your concerns about this important food source for all types of fish species. Menhaden also serve as roving filters, converting algae into energy and thus reducing nutrient loads in bays and covers. An adult menhaden, through its unique filtering gills, is able to process up to 4 gallons of water per minute or a million gallons of water every 180 days. Multiply this by the number of menhaden in any given area and this is an amazing amount of water being filtered, a reduction of nutrients means fewer algae blooms and ultimately more oxygen for all fish. The ASMFC Public Hearing in Rhode Island on Draft Amendment 2 to the Interstate Fishery Management Plan for Atlantic Menhaden will take place November 1, 6:00 p.m. at the University of Rhode Island Bay Campus, Corless Auditorium, South Ferry Road, Narragansett Rhode Island. Contact Jason McNamee at 401.423.1943 for more information. Offshore. Jim Otis of Half & Half Charters, South Kingstown landed an 85 pound yellow fin said Dave Henault of Ocean State Tackle when fishing two miles south of the Fishtales. He also boated a number of three to four foot mahi mahi using butter fish as bait on the same trip. “The vessel Aerie One did well at the Fishtails this week” said Matt Conti of Snug Harbor Marina in South Kingstown. “They caught nine yellowfin to 70 pounds trolling during the day and chucking butter fish at night.” said Conti. Tautog. Ken Landry of Ray’s Bait & Tackle Warwick said, “Customers are catching tautog at Hope Island, General Rock and At Coddington Cove in Middletown. I am sure they are further north in the Bay too.” Capt. Chuck Daignault landed tautog to 21” while fishing on my boat this weekend at General Rock, North Kingstown. Beavertail his been a great spot for fishing this fall too, said Dave Henault of Ocean State Tackle. False albacore and bonito. False Albacore are still running strong all along the southern coastal shore said Matt Conti of Snug Harbor. Some bonito were caught last week when customers were trolling for tuna said Conti. 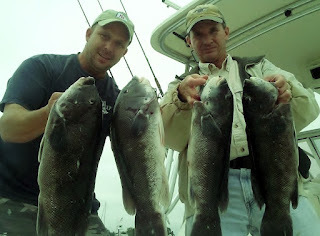 Great tautog fishing: Tom Peters of Warwick (left) and his brother Allan limited out on tautog this weekend at General Rock, North Kingstown, fishing with green crabs and conventional double hook tautog rigs. Jigging continues to gain popularity with fishermen that target bottom fish like fluke and tautog as well as striped bass and tuna that might be anywhere in the water column. I attended the Rhode Island Saltwater Anglers Association (RISAA) monthly seminar last week and one of the topics was vertical jigging for bass and tuna. Ronz Lures use Owner and Gamakatsu hoops. Their hydro jig heads are made of pure tin which make them durable and non-toxic. Soft plastic tails are fish oil infused. Find Ronz Lures on line at www.ronzmfg.com . Bottom jigging for fish such as fluke and tautog is more popular than ever before too. With the tautog season upon us you might want to give jigging for them a try. Jigs come in many weights from ¼ once to 10 ounces. Using light tackle to jig for tautog creates a whole new type of tautog fishing. It makes catching even small tautog a lot of fun. To take a look at tautog jigs visit www.htlureco.com . After losing two anchors that were caught in structure I have started to use a cinderblock when anchoring over severe structure to tautog fish. Often you want to be on top or on the edge of structure so the more precise you are with boat placement the better the fishing. Because the cinderblock can be dropped anywhere, even on top of rocks, it allows you to be targeted with your boat placement. If you lose a cinderblock who cares… they cost $1.29 at Home Depot. Use a chain on the block to avoid line chaffing. How to get the chum down to where you want it? Fill a brown paper lunch bag with your chum (grass shrimp, crab legs, pieces of clam, crushed crab, etc.) and a three to four inch rock. Tie a line to the bag and lower it to where you want the chum, let it sit on the bottom for a couple of minutes and then yank the line. The bag breaks and releases the chum exactly where you want it to go. The technique was shared by a RISAA member a few years ago. Here is a tip from George Poveromo’s “Rock’em Sock’em” article that appeared in a back issue of Saltwater magazine. When a fish is hooked and it has muscled its way back to structure, apply pressure forcing a respectable amount of bend in the rod. If the fish is not moving, hold the rod vertically to the water, tighten the line and pull or pluck the fishing line like a banjo string. The sharp vibrations emitted work their way back down to the fish through the line and irritate it. The fish, in a state of confusion, may back out of the hole to free itself from the irritation. Once you sense this has happened start reeling in the fish. If this does not work try letting the line just go limp for a minute or two. With no pressure on the fish, it may dislodge itself. The rig often frees itself, the fish may get unhooked, or you may still catch the fish. The Department of Environmental Management (DEM) announced that the bay scallop harvest season will open at sunrise Saturday, November 3 and continues until Saturday, December 31 at sunset. Rhode Island residents can take up to one bushel of scallops per day without a license, and commercial license holders can take up to three bushels per day/per boat from state waters. Non-license holders cannot offer scallops for sale. Harvesters are reminded that possession of seed scallops is prohibited. Legal scallops possess a defined, raised, annual growth ring. To protect scallops and bottom habitats from dredge damage, scallops can be harvested by dip-net only from a boat from November 3 through November 30. Dredging will be allowed after November 30 to access remaining adult scallops residing in deeper waters. Visit www.dem.ri.gov for additional information. The US Coast Guard will hold a safe boating class on October 27, November 3, 10 and 17 from 1:00 p.m. to 4:00 p.m. The cost will be $50.00 which includes all the materials. Participants will get both State and Coast Guard Certified. Class size is limited to 30. Sign up today by calling Debbie Wood, Wood Boat & Motor, Inc., 3630 West Shore Road in Warwick, RI 02886 or at 401-739-4040. Freshwater fishing is expected to improve as DEM stocks select area ponds and rivers with trout for the fall season. Visit www.dem.ri.gov for details. Tautog. Patti Ferrara of Ray’s Bait & Tackle, Warwick, said, “Customers are catching tautog at Ohio Ledge and around Prudence Island.” John Wunner of John’s Bait & Tackle said, “Customers are catching tautog at about a 10 to 1 ratio. One of my customers, a young man, caught a 4 pound, 2 once and a 5 pound, 5 once tautog when fishing with his Dad.” Angler Tom Peters of Warwick and his brother Allan limited out on keeper tautog at General Rock, North Kingstown this weekend. Tautog season heats up: Captain Dave Monti with one of the tautog (21”) caught while fishing the General Rock, North Kingstown area this weekend. 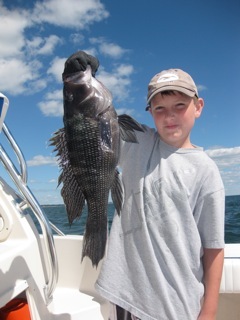 Black sea bass bite still strong: Quinn (Squid) Antonacci of West Greenwich with the 22” black sea bass he caught on his grandfather Ken Robinson’s boat in the Brenton Tower area in 75 feet of water. Wakefield resident lands Mako: John Stavrakas (in photo) with the 221 lbs Mako shark he landed last week with his neighbor John Ott on board. 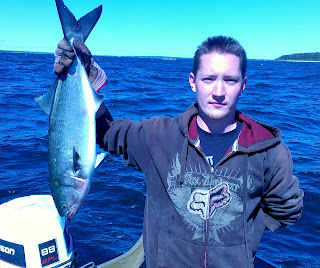 Bluefish bite here: Bill Houle, Jr. of Warwick and his father found the bluefish this weekend off the Prudence Island T Wharf. 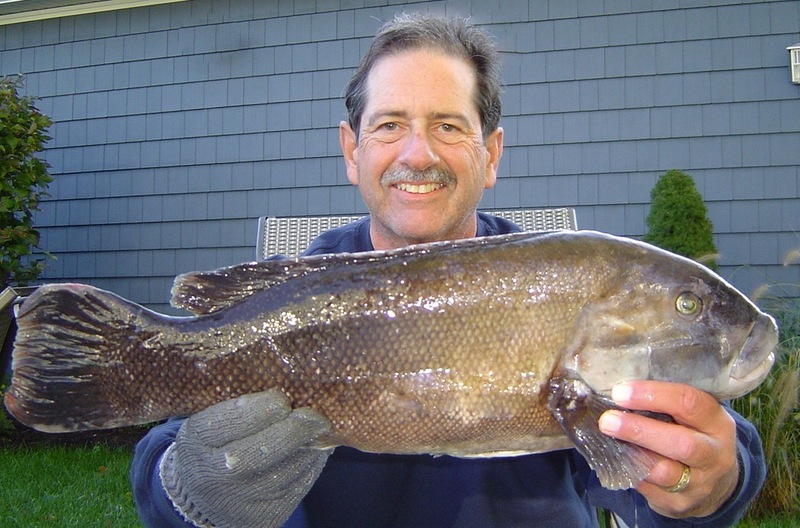 Anglers are catching great keeper tautog in the Bay and off coastal shores. The fish are biting Asian and green crabs. The fall tautog season is here. Go out and fish. Don’t forget to explore and discover your own spots. Tautog are generally anywhere there is structure… rock clusters, jetties, docks, wrecks, humps, etc. Tautog regulations. In Rhode Island tautog have to be sixteen inches or more. The catch limit for recreational anglers from August 1 to October 14 is three fish/person/day. The limit jumps to six fish/person/day on October 15 through December 15. However, there is a ten fish per boat limit during all periods. The boat limit does not apply to charter and party boats. The bite. Feel the bite… tap, tap and then get ready for a tug of war. Captain George Cioe said, “I believe with the first tap the tautog is positioning the bait for consumption.” So at the second tap I raise the rod up firmly feeling for the weight of the fish (no need to jerk the rod up hard). Once the fish is hooked, keep the rod up and pressure on so the fish is not able to run for cover. Where to fish, what type of bottom? From shore, look for rocky coastline like Beavertail Point on Jamestown, locations off Newport, Point Judith and off jetties at South County beaches. From a boat, I have had good luck at Plum Point light, rock piles off Narragansett, the jetty at Coddington Cove in Middletown, General Rock in North Kingstown (we found a great tautog bite at General Rock the past two weekends with fish to 21 inches), Hope Island, around Brenton Reef in Newport, Whale Rock, Ohio Ledge in the East Passage, Nebraska Shoals off South Kingstown. 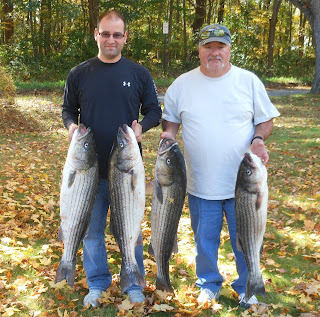 On Saturday, September 29th at 1:00 p.m., anglers will gather to celebrate another successful striped bass season at On The Water Magazine and TV’s StriperFest. The event will be held at Falmouth Marina Park and include live music by the Deepwater Blues Band, Budweiser beer, tasty Black Dog fare and games and attractions for the whole family. 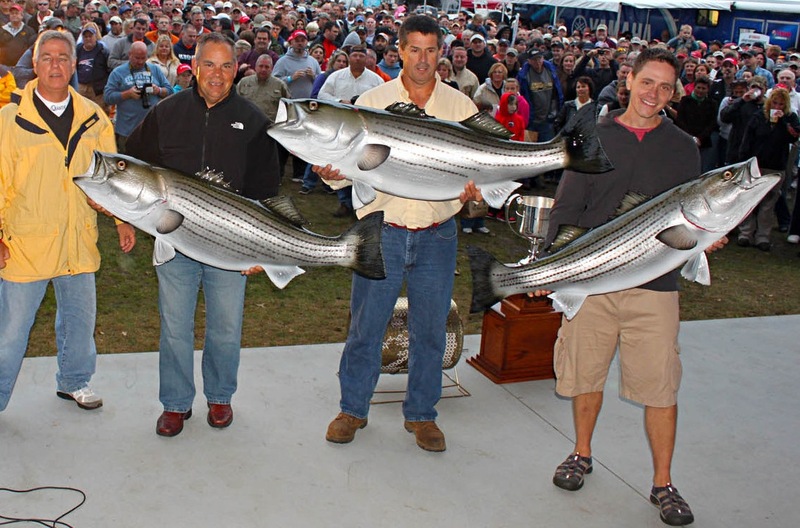 The event celebrates the end of the 2012 Striper Cup, a five-month long fishing tournament that attracted thousands of anglers from New Jersey to Maine to compete for over $150,000 prizes. Bonus Day, Friday, September 28th, noon to 5:00 p.m. with ongoing seminars and demonstrations. Visit www.OnTheWater.com . DEM’s Aquatic Resource Education program is offering introduction workshops to saltwater surf-fishing and fly-fishing, a fly-fishing trip via train around Aquidneck Island, and fly-tying workshops. Contact Kimberly Sullivan at 401.539.7333 or kimberly.sullivan@dem.ri.gov for information. “Surf Fishing: The Basics, an introductory course was held Wednesday, September 26. “Introduction to Saltwater Fly-Fishing” Saturday, September 29, 9 a.m. to 3 p.m. at the US Fish and Wildlife Service's Kettle Pond Visitors Center, Charlestown. Learn about fly-tying, casting techniques, and knot-tying. $35 per-person. “Fly-Fishing Express,” a fly-fishing safari around Aquidneck Island on the Old Colony Train Saturday, October 27, 9 a.m. to 3 p.m. Stop at remote public access fishing areas. Learn about the best flies to use and fly- fishing tactics. For advanced beginner, intermediate and advanced fly-fishing anglers. Bring chest waders, other equipment provided, $35 per-person. “Fall Fly-Tying 2012” sessions held on six Mondays beginning October 22 to December 17 from 7 p.m. to 9 p.m. at the North Kingstown Community Center. Learn beginner and intermediate fly-tying techniques for fresh and saltwater fishing. $5 for each class or $25 for all six sessions. Striped bass. Bob Masse limited out on striped bass at Block Island while fishing with friends Saturday. Angler Mike Swain of Coventry said, “We fished the Bay for stripers Friday night and did not have any luck.” Al Conti of Snug Harbor Marine, South Kingstown said, “The bass bite slowed this weekend at the Southwest Ledge off Block Island… the fish are there, the divers are getting them… there is just so much food around that you have to be fishing when they’re feeding.” Albert and Kevin Bettencourt of East Providence are catching midsized bass at night during tide changes drifting eels.”, said John Littlefield of Archie’s Bait. Offshore. 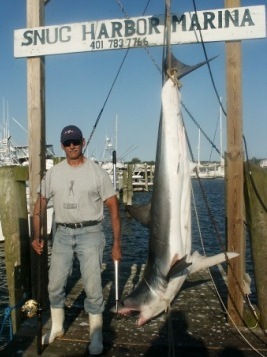 Barry Bordner of South Kingstown landed a 300 lbs. bluefin tuna this weekend at the BD Buoy south/southeast of Nantucket said Al Conti of Snug Harbor. Reports of one giant hook-up at the Mud Hole this weekend. Green bonito and false albacore fishing is excellent all along the RI coast from Westerly to Newport. “Albies (False Albacore) and Green Bonito are all over the place… (anglers) all along the coast are having a blast with them.” said Al Conti of Snug Harbor. Bluefish. “The past couple of days the schools (of bluefish) have been circling the waters just southwest of the "T" wharf (Prudence Island). No frenzies yet but they have been consistently hitting bright plugs and ignoring natural colors.” said angler Bill Houle, Jr. of Warwick. Scup. Scup bite strong a the East Fishing grounds, Brenton Tower area and in the Bay. Max DiStoto caught a 3½ lbs. scup this weekend at Nebraska Shoals.